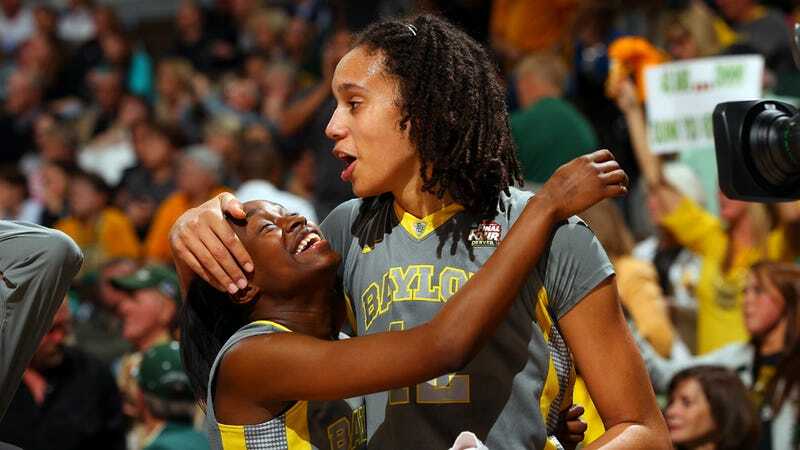 Baylor University Baller Brittney Griner Might Get a Shot at the NBA, But Should She Take It? Dallas Mavericks owner Mark Cuban caused a bit of a stir on Tuesday night when he said that he had "no problem whatsoever" with allowing Baylor University centre and women's college basketball's all-time leading shot-blocker Brittney Griner a chance to try out for a spot on Dallas' summer league team. "If she is the best on the board, I will take her," Cuban said before the Mavs' Tuesday night game against the Los Angeles Lakers. "I've thought about it. I've thought about it already. Would I do it? Right now, I'd lean toward yes, just to see if she can do it. You never know unless you give somebody a chance, and it's not like the likelihood of any late-50s draft pick has a good chance of making it." "She'd still have to make the team," Cuban said. "I'm not going to carry her just to carry her. I don't think, anyways. But I certainly wouldn't be opposed to giving her the opportunity." For her part, Griner is totally game. Griner would not be the first woman to try out for the NBA (UCLA basketball player Ann Meyers tried out for the Indiana Pacers in 1979), but Cuban does recognize that having her as a player could have great marketing potential. "It would, wouldn't it?" he told ESPN. "See how she could do? That'd sell out a few games." Of course, using Griner as a gimmick to sell out stadiums is a little unseemly, especially when she could be playing in the WNBA where she would be praised and endorsed for her athletic merits rather than as a sideshow attraction. Brittney Griner has the potential to be a franchise-leading, league-dominating superstar in the WNBA...She's not a gimmick to be gawked at and over-scrutinized by the collection of NBA executives and bored NBA freaks who watch the Summer League every year. No, at that point in her summer schedule she's supposed to be here, doing damage for the Phoenix Mercury and leading a turnaround for a proud franchise that has been in the WNBA Finals four times, while winning the championship in 2007 and 2009. This is her sport, and soon to be her profession. Why talking heads and now NBA owners continually and pointlessly have to judge Brittney Griner in the reflection of her middling male counterparts shows that we still have so, so far to come. The chances of Griner even being available to the point of the NBA draft are slim to none. The WNBA draft starts April 15, over two months before the NBA's, and Griner is most likely to be the top pick. In other words, she'll be playing pro ball before Cuban can even get to her. But if Griner is good enough to make it into the NBA, why shouldn't she? The minimum annual salary for a new NBA player was $490,180 in 2012. For players in the WNBA, it was $37,260. Griner could garner a lot more money and a lot more fame playing in the men's league, but maybe that's what's actually broken about this. Women's sports don't get the recognition and hype surrounding men's sports so the WNBA gets less money from advertisers, the players get lower salaries and the league is considered lower status, which then kicks the cycle off all over again. If Griner is any indication, there are some thrilling and amazing athletes in women's basketball. Maybe we should start treating the WNBA with a little more respect so that players won't feel like they have to go off and play with the boys in order to get it.